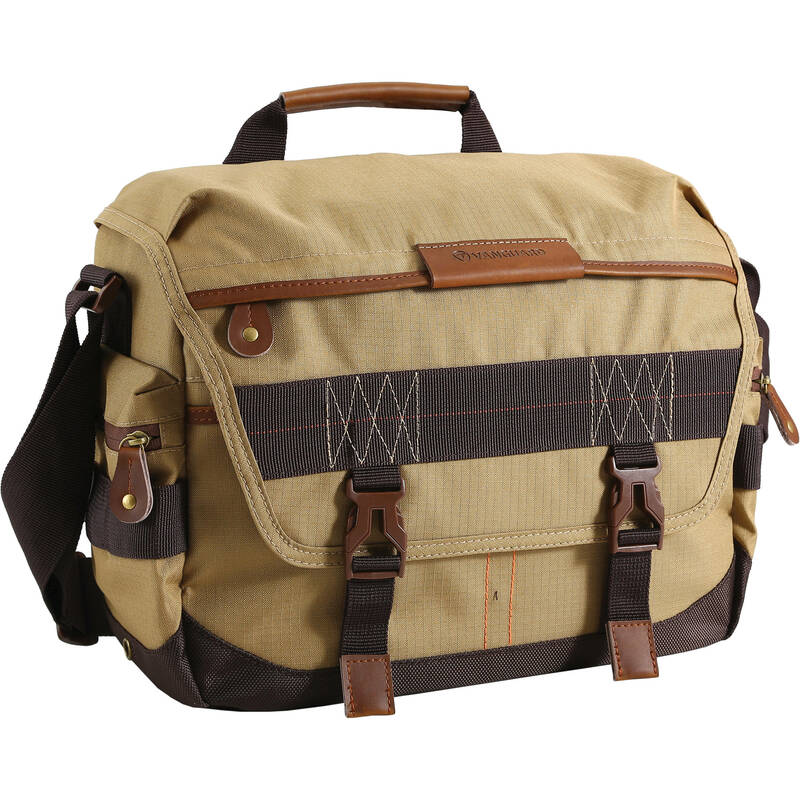 For jaunts cross-town or cross-country, the tan Havana 33 Messenger Bag from Vanguard will hold and protect your DSLR with attached lens, 1-2 extra lenses, flash unit, accessories and a 13" laptop. The bag features a zippered main compartment covered by a large flap with two quick-release straps. Inside this compartment is a removable, padded insert with two removable padded dividers for organizing your gear. For everyday excursions which don't involve photography, you may free up space for extra personal gear by removing the insert. Within the shoulder bag next to the insert is a slip-in pocket with a touch-fastening tab for storing your 13" notebook. On the front wall of the compartment is a sewn-in pouch with two clear, slip-in memory card pockets. The exterior, front flap of the Havana 33 features a zippered pocket for storing your smartphone, wallet, and other small items. Inside this pocket is a key lanyard and a removable rain cover. Each side of the bag features a slip-in pocket for holding a water bottle, gloves, or similarly sized items which closes with a fabric cover. The Havana 33 can be carried by its top handle or adjustable, padded shoulder strap. For traveling with rolling luggage, the back of the bag features a convenient handle, pass-through strap. And for improved interior visibility when locating gear in low light, the inside of the bag is made of light gray 150D polyester and velvet. Box Dimensions (LxWxH) 14.9 x 11.9 x 7.4"
Havana 33 Messenger Bag is rated 4.9 out of 5 by 8. Rated 5 out of 5 by Rennis from Great bag for street shoots I wanted this for a smaller bag to carry a camera & a lens or two plus a flash, as well as my Air Book for day use. It exceeds in this purpose. I can fit my Canon 5D Mark II with a 24-105mm lens as well as a 17-40mm and a flash. It will also hold a camera and a 70-200mm f/2.8. The Air Book fits securely. It has a padded internal compartment that can be pulled out if you want to use the bag for non-photography items (books, etc.). I like the canvas bag look as it's not what you see everyone else use. My only concern is the durability of the plastic latches that hold the flap. The seem like light-weight plastic and I'm not sure how long term wear will effect them. Rated 4 out of 5 by Anonymous from Good choice for around town travels Easily holds my Olympus OMD EM-1 even with the 40-150 pro attached. Plus the 12-40 and an additional lens. Plenty of room for my Note 12.2 inch tablet too. Only a few small complaints; the various small pockets are really tight and the rain cover is not truly waterproof (might ScotchGuard mine). I wish that the grab handle was h bit more robust or had a location that offered better bag balance when carrying the bag (it is too far to the body side). Also wish it had a few places to clip on a carabiner for a water bottle or small items. Still I was happy using the bag for a long weekend. Rated 5 out of 5 by tmuss from Worth the money Holds my GH4 and 3 lenses with room for extra batteries, cards, notebook, etc. Seems well made with nice strap that rides comfortably on shoulder. Rated 5 out of 5 by Anonymous from Really terrific reasonably priced camera bag. I bought mine as a spur of the moment purchase when I bought into the Fuji system. This is very lightweight and the strap is wide and comfortable. Inside is a camera box that is separate. It holds my Xpro2 with lens, and dividers for 3 or more other lenses, with lots of external room for the many other things we tend to carry. Room for a laptop and plenty more. Rated 5 out of 5 by Nancy from Better than a backpack I have always traveled with my camera equipment in a backpack. I like backpacks because they spread the weight across both shoulders. But I dont like that I have to take it off to get to my camera. This bag does a good job spreading the weight on my back while giving me the freedom to grab my camera or another lens without setting the bag on the ground. The bag is well-made and comes with a rain cover. An extra plus! Rated 5 out of 5 by Andre25 from Very good considering the price I bought this bag to carry an E-M1-II with the 300mm f/4 attached . The combo fits nicely in the bag with the photo insert removed (Hood retracted). There is nothing to complain about this bag. It does what it is supposed to do. With the photo insert remove, there is no padding left so I use a Tenba protective wrap around the lens/camera. That brings some decent protection. Overall, I am happy with my purchase. Rated 5 out of 5 by Manu M. from Good product I liked a lot. Its so comfortable. What's the internal volume of the Havana 33 bag in liters? Thank you for your interest in the Havana 33. The internal volume is 13L.